The Company announced that it has closed the second tranche of its non-brokered flow-through and non flow-through private placement for gross proceeds of $921,190. The first tranche closed on February 16, 2012 for gross proceeds of $442,450. April 3, 2012, Vancouver, Canada - El Niño Ventures Inc. ("ELN" and the "Company") (TSX.V: ELN; OTCQX:ELNOF Frankfurt: E7Q) is pleased to announce that it has closed the second tranche of its non-brokered flow-through and non flow-through private placement for gross proceeds of $921,190. The Company issued 4,445,692 non flow-through units (NFT Units) at a price of $0.13 per NFT Unit. Each NFT Unit consists of one common share and one-half of one non-transferable share purchase warrant ("Warrant"). Each whole Warrant will entitle the holder to purchase one common share of the Company at a price of $0.23 per share for a period of 18 months from closing subject to an accelerated expiry, such expiry being accelerated to 30 days in the event the Company's shares have closed at or above a price of $0.40 per share for 10 consecutive trading days on the TSX Venture Exchange. In addition, the Company issued 2,288,334 flow-through units ("FT Unit") at $0.15 per FT Unit. Each FT Unit consists of one common flow-through share and one-half of one non-transferable, non flow-through, share purchase warrant. Each whole Warrant will entitle the holder to purchase one non flow-through common share of the Company at a price of $0.25 per share for a period of 18 months from closing subject to an accelerated expiry, such expiry being accelerated to 30 days in the event the Company's shares have closed at or above a price of $0.40 per share for 10 consecutive trading days on the TSX Venture Exchange. The Company has paid $26,656 and 192,500 warrants in finder's fees in connection with this second tranche closing of the private placement. All of the securities to be issued by the Company in connection with this private placement will be subject to a hold period, which expires July 31, 2012, four months and one day after the closing date. The Company currently has three drill rigs operating on the property with the objective of upgrading the inferred and indicated resources to measured resources, defining additional near-surface resources as well as completing preliminary metallurgical testing on selected portions of the deposit. A minimum $3 million budget has been proposed for the 2012-2013 exploration program. The budget includes $2.5 million for diamond drilling work on the Murray Brook deposit and a $500,000 exploration geophysical program on Murray Brook property and the adjacent Camel Back property (Figure 1). The objective of this exploration program is to explore for VMS deposits at depths of up to 200 metres below surface. 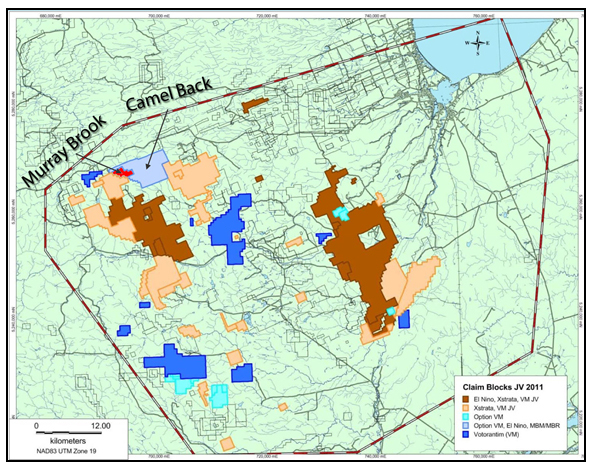 The Camel Back property is located in the area between the Murray Brook deposit to the west, which is the fifth largest in the Bathurst Mining Camp (BMC), and the Caribou deposit to the east (Figure 1). In 2011, ELN and Votorantim spent $2.1 million on exploration; and completed 10,327 metres of drilling. With excellent drill results to date, a +$3.0 million exploration/drill program is now underway with 30 drill holes for 5,000 metres completed with assays pending. The first NI43-101 Mineral Resource Estimate for the Murray Brook Zn-Cu-Pb-Ag-Au deposit, which includes explanatory footnotes, is presented in the table below (see ELN press release dated February 28, 2012). The resource estimate is based on various assumptions regarding mining methods, processing and metal recoveries, payable metal NSR credits and metal prices. This estimate makes no provision for capital costs to mine the deposit, nor mill the material mined, as resources are not reserves and the reader should not presume economic viability. You can view the Next News Releases item: Wed Apr 4, 2012, Early Warning News Release for Harry Barr, President and CEO of El Nino Ventures Inc.